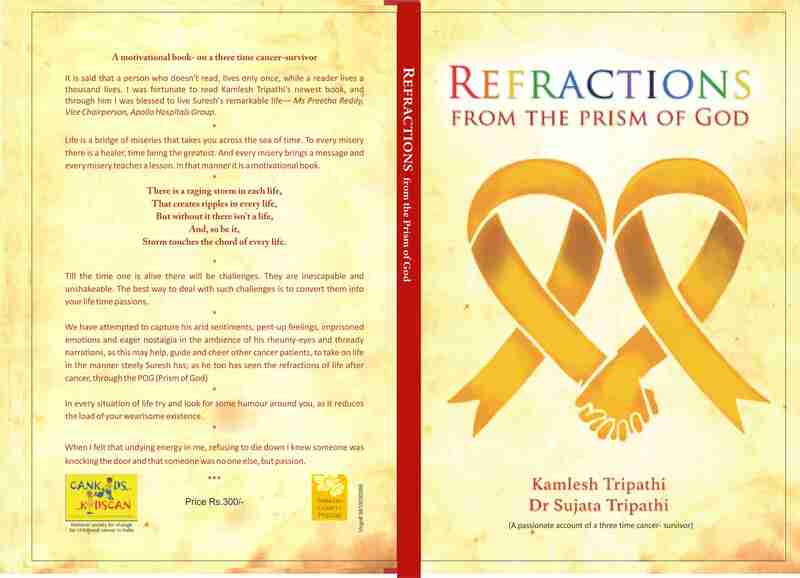 Book title: REFRACTIONS … FROM THE PRISM OF GOD– You could download the e-book from antrik.com or pothi.com for just Rs 100 or $1.50. Collections will be utilised for poor children suffering from cancer. What goes on in a cancer patient’s mind is not known even to his near and dear ones, what to talk of anyone else. Maybe, only the invasive part is revealed, and the rest remains within the confines of the patient’s mind. It is said about cancer, that only the ones who have seen cancer from close quarters are sensitive about it, and the rest are not. This includes cancer patients, their near and dear ones, Parents of child cancer patients, and also people who have lost their loved ones to cancer. A normal and healthy person may not even think about cancer, forget reading about it, because your mind is clouded by a plethora of interesting things around you, where the word ‘cancer’ is somewhat uneasy and eerie. But there is still a need to communicate to the society about the incessant suffering of a cancer patient. This book does exactly that. It communicates the mindset and sufferings of a poor, young and a three time cancer survivor Suresh from Chennai in a comforting and engrossing manner that readers would like to read. First time when Suresh got cancer he was six, and then he was okay for a decade and a half. But it struck again when he was twenty one and again when he was twenty four. All three were different types of cancer. Suresh wanted to tell his story for the benefit of other cancer patients. Primarily, to make them understand the challenges of a young cancer patient. Where, he has his entire life in front of him in terms of his school, college, professional education, career and aging parents. When, he doesn’t even know how long he is going to survive. And in all of this he builds his determination and alters his mindset to take cancer head on. The book has a motivational slant. That cheers you up with peppy poems and morale raising short stories, while it unfolds the grit and determination of the protagonist. Number of cancer cases in the world, are on the rise and there is a great need to communicate the sufferings, trauma, and the challenges of a cancer patient to people in general. Also, there is need to communicate how to handle such situations, and more importantly make people realise that cancer is conquerable. The author of this book is Kamlesh Tripathi and co-author is Dr Sujata Tripathi who had lost their younger son to brain cancer. The book is endorsed by Ms Preetha Reddy, Vice Chairman, Apollo Hospitals Group. The book is co-published by Cankids … Kidscan and Shravan Charity Mission. Both are NGOs that work for children suffering from cancer. The gutsy founder of ‘Cankids … Kidscan,’ is Ms Poonam Bagai who herself is a colon cancer survivor. But that has not deterred her. From taking up the noble cause of child cancer in India. Sharvan Charity Mission is an NGO that was started by the author and the co-author in the name of their late son Shravan that also works for child cancer.